It is the de rigueur ingredient of south Indian cuisine. Curry leaves being fried along with spluttering mustard seeds give a warm aroma of wholesome food. Called kadi patta or meethi neem in Hindi, karuvepillai in Tamil and karibevu in Kannada, curry leaf has a slightly bitter taste if consumed in large quantities. But in small quantities it adds that zing to the food—and drink. Nimbu paani or lemonade served with a couple of curry leaves floating in it gives the drink a unique flavour. Butter milk or chhachh served with these leaves has a unique taste. It can be used fresh, dried or even fried. But it is not always something you add to a dish. It can be a great accompaniment in itself. My earliest memory of curry leaves as a dish is of “karuveppilai thuvayal”. It is a thick chutney of sorts. It was an essential part of cooking during shradh, a Hindu ritual to pay homage to one’s ancestors. When shradh is performed it is customary to feed the Brahmin priests. Cooking is elaborate, with 18-20 dishes, including sweets and snacks, made in ghee or oil. I was told that finishing off the entire feast—sapadu in Tamil—with curd rice accompanied by karuveppulai thuvayal would aid digestion. The chutney has a sweet, bitter tangy taste which I detested as a child. My mother would coax me into eating it with words like “your hair will grow nice and thick if you eat this regularly” and “your eyesight will remain excellent if you eat curry leaves and its chutney”. The dark chutney would conjure up the vision of similarly dark hair. That’s how I developed a taste for it. I make the chutney regularly from the leaves of the curry plant growing in a pot in our balcony. Curry leaf’s uses are part of folklore. An often mentioned virtue of the leaves is that eating it helps in hair growth and darkens the hair. A beauty recipe followed in homes across south India is to add curry leaves, along with pepper, cumin seeds and a bit of rice, to coconut oil. This is then heated and applied to hair regularly. Curry leaves are said to have anti-ageing properties and are an excellent source of Vitamin A. They have been part of the culinary vocabulary in India from earliest times. In A Historical Dictionary of Indian Food, K T Achaya has described curry leaves as being used as seasoning in south India centuries ago. He writes that “early Tamil literature notes the serving of a dish of the tender fruit of pomegranate cooked with butter and fragrant curry leaves”. Curry leaves find mention in ayurveda as well. Centuries later, some of its health benefits have been validated by scientists. Curry leaves (Murraya koenigii or Bergera koenigii) have the potential to benefit diabetes and heart patients. Researchers at three Indian universities—A P Department of Home Science, Bhilai Mahila Mahavidy-alaya, Raipur; G B Pant University of Research and Technology, Pantnagar; and the Department of Process and Food Enggineering, College of Techcnology, Pantnagar—have found that curry leaves have a number of medicinal properties. These include anti-diabetic and cholesterol-reducing property, antimicrobial activity, anti-ulcer activity, anti-oxidative property, cytotoxic activity, anti-diarrhoea activity and phagocytic activity. Researchers at the Department of Pharmacy, King’s College London, have found scientific justification for the use of curry leaves as alternative medicine to control diabetes. It is believed that the leaves may contain agents that slow down the rate of starch-to-glucose breakdown, thus, control the amount of glucose entering the bloodstream. Researchers at the Department of Medical Chemistry at Mejio University in Japan think the leaves also have cancer-fighting properties. The leaves also have a special property that can make people move houses! Actually, this one is an old wives’ tale. They say the person who plants a curry tree in his house usually has to move houses sooner or later. The planting should be done by the person herself for it to come true. My mother did this when we were living in a rented house just to speed up our entry into our own house which was being built. Voila! It did work. Take a handful of fresh curry leaves, preferably the young tender ones. Wash them well and dry. Lightly dry roast them taking care to ensure they do not turn black. Let the leaves cool. Add half a spoon of jeera, black pepper and salt. You can roast jeera if you prefer. Grind this to a fine powder. This is an excellent alternative to the 'gunpowder' served with idlis. 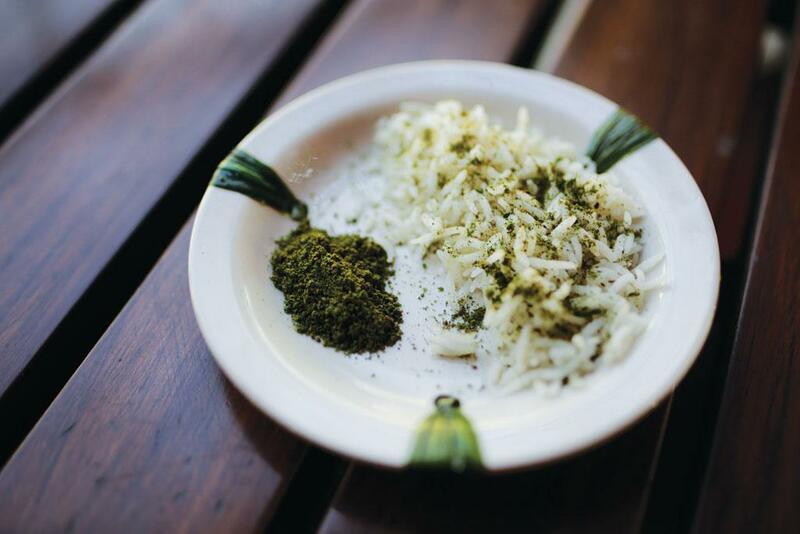 The powder can also be sprinkled on rice and eaten with hot ghee. It is excellent for digestion and soothes the stomach in summers. You can store it for months in an airtight jar. Wash the fresh tender curry leaves. Dry roast the sesame seeds. Add the roasted seeds, jaggery and tamarind to the curry leaves. Add some water and grind it to a fine paste. The jaggery and tamarind evens out the slight bitter taste of the curry leaves. This is more like a spread or paste that can be eaten with almost anything. It is not watery like a chutney. It is soothing in summers.